From a Young age, I always took an interest in building things. I spent a lot of time with my grandfather who found all kinds of different projects for us to work on including model airplanes and houses. As I grew up, I continued to take the same approach, making and modifying things to suit my taste. When leaving school, a lack of good careers advice and a little bit of stubbornness meant I found it very difficult to decide on a career outside of my immediate interests. It took me a few of years working in an office to finally realise that I could use the skills from my hobbies to build a career in something much more practical. In 2013 I took on an apprenticeship in Medical Engineering, a job where I get to work with a wide range of technology as well as having free reign to a full mechanical workshop where I have been trained to design and manufacture bespoke pieces of equipment for use the hospital. Because I’ve had such a positive experience from my apprenticeship, especially since finding it so difficult to find my way into a career, I felt the least I can do was to provide a bit of information for children and students who may be in the same situation as I was in. If I’d have been given the advice I needed at a young age, I could have saved myself years of wasted time in the office. If I was to give one piece of advice to a young person wanting to pursue an apprenticeship in Medical Engineering, I would recommend taking initiative to gain experience wherever possible, as this is what will help you stand out in interview. Experience doesn’t always need to be in the workplace, take on hobbies such as building computers, tinkering with cars and gadgets; this gives you something interesting to talk about in your interview and helps to show your passions. 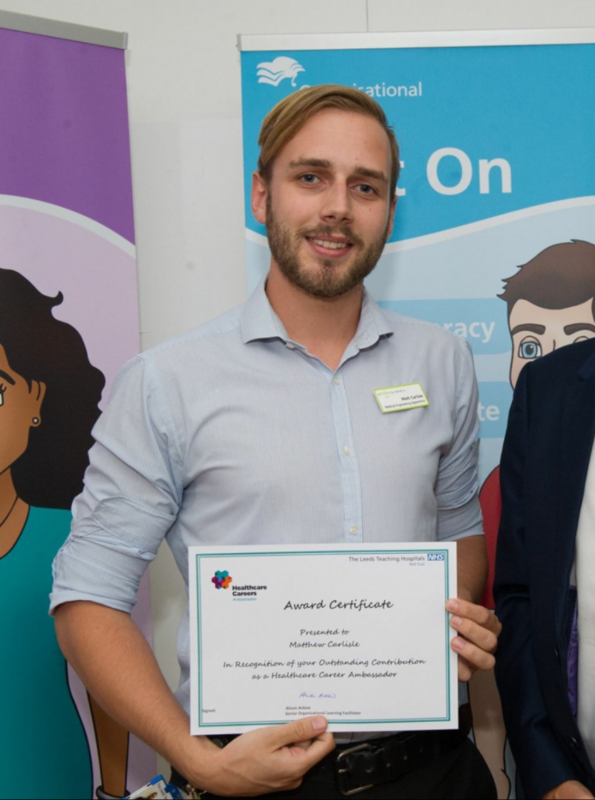 Becoming a volunteer has been very rewarding; through our activities as ambassadors we have helped to inform a number of young people about the possibilities of careers in the NHS. By attending such events we have also found the added benefit of finding potential candidates for our yearly intake of apprentices and have successfully recruited through our attendance to careers events. The involvement in volunteering is flexible and only needs to be as often as you feel you are capable, it is not by any means a huge task and is actually very enjoyable. I usually attend events with one of my many colleagues who also volunteer for various organisations, this way we can help each other out if we get a tricky question. When attending Inspiring the Future events, I enjoy meeting all the different kinds of people. Some times for example, we could have someone who is very shy and we work with to get them out of their shell and get them interested in what we do, other times we can have large groups of very chatty people who we can have a laugh and a joke with while advising them on possible career opportunities.